For accurate continuous in-line colour measurement. Guarantee your customers a high and constant colour quality and reduce waste by fast product colour feedback,. The X9 can be used in any industry where colour is important as a product enhancer or as a process control indicator. -Guarantee your customers a high and constant colour quality. –Reduce waste by fast colour feedback, for process control. –Reproduce the same batch colour months later by saving settings. -Log production data to a pc for customer quality reports. -No more human errors during visual inspection. 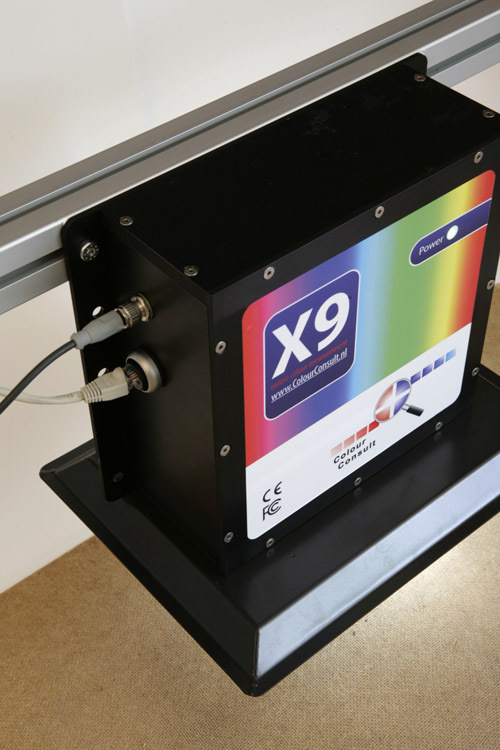 The X9 in-line spectrometer is an accurate industrial colour measurement instrument intended for continues measurement and monitoring for inline colour quality control. The X9 uses dual beam technology, the first spectrophotometer measures the object the second spectrophotometer measures the changes in light to compensate for aging or spectral changes. The long lasting led light prevents frequent light bulb changes at difficult to reach locations. The X9 comes in two versions: X9-vis and X9-uv-vis. The X9-vis measures standard human eye color. 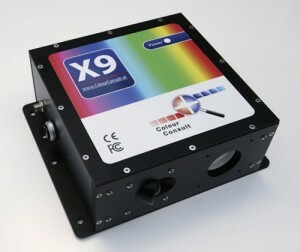 The X9-uv-vis has an extra uv light source and can measure optical brighteners in the extended spectral range. The X9 comes with standard windows based software to log and report colour production data. Alternatively oem customers can write their own software via the easy to use software api. The instrument modular setup provides solutions for a wide range of applications. Optimization of distance from substrate and area of measurement. Adjustment of measurement angle to accommodate gloss and texture. Multiple X9 spectros can be linked and controlled from one central PC by use of ethernet, allowing inspections at various positions in the process. The software can store system settings in a database for later retrieval to guarantee your customers a constant colour quality. The X9 can easily be installed via the 6 mounting holes. The light trap and calibration tile are included.